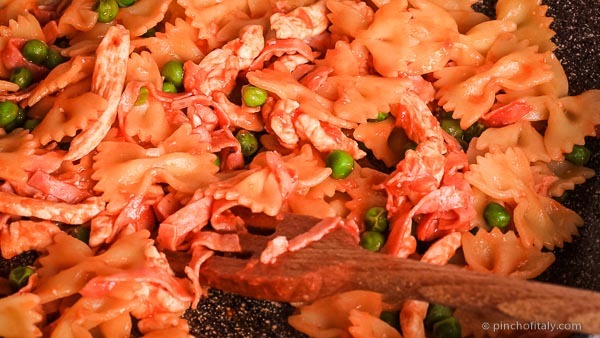 Ham and peas are common ingredients used in an Italian cooking. Especially cooked ham, Italian prosciutto (ham) cotto (cooked). 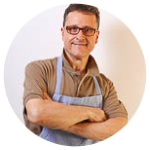 Ideal and used to make classic Italian “panino” that could be a sandwich, ham roll or American sub. 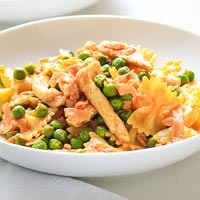 Though the main ingredients which are playing the biggest role in this recipe are pasta and chicken breast. 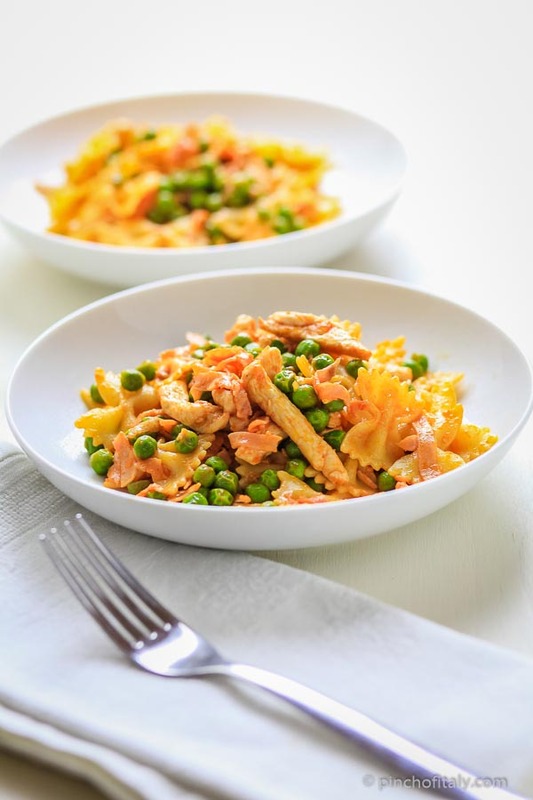 It's a simple dish that will do for children too, and it's also fine for those who must deal with calories. As soon as you can, set the water for pasta to boil. 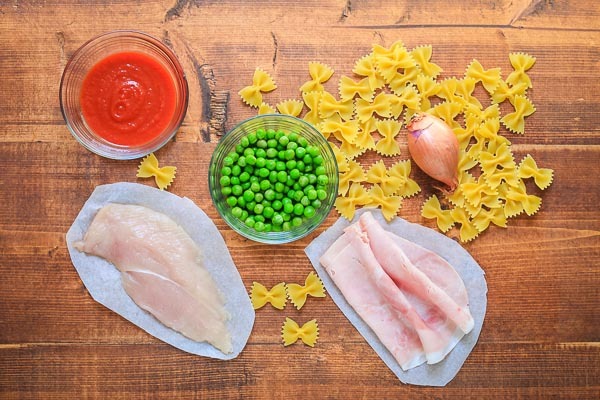 Then, take the chicken breast and slice into thin stripes. Do the same with the cooked ham. Afterward dice the onion too. In a frying pan pour 2 tbsp (30 ml) of extra-virgin olive oil. Add the diced onion and slightly-fry. 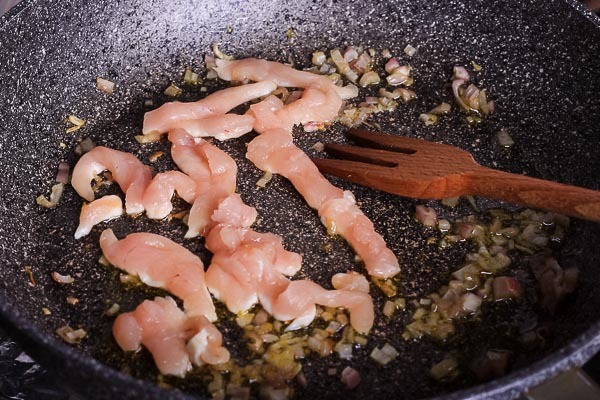 Add the stripes of chicken breast and cook with the onion. 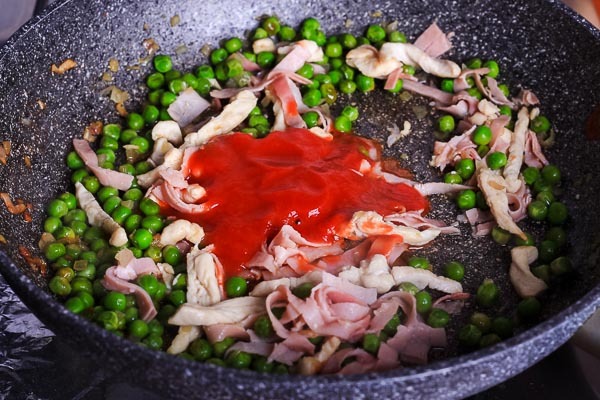 Turn back to the frying pan, add the stripes of cooked ham, precooked peas and tomato puree. Cook all on low heat for about 2 minutes mixing all together. If you are not ready with pasta turn off the heat and keep aside. Meanwhile the pasta must have cooked, so drain it. 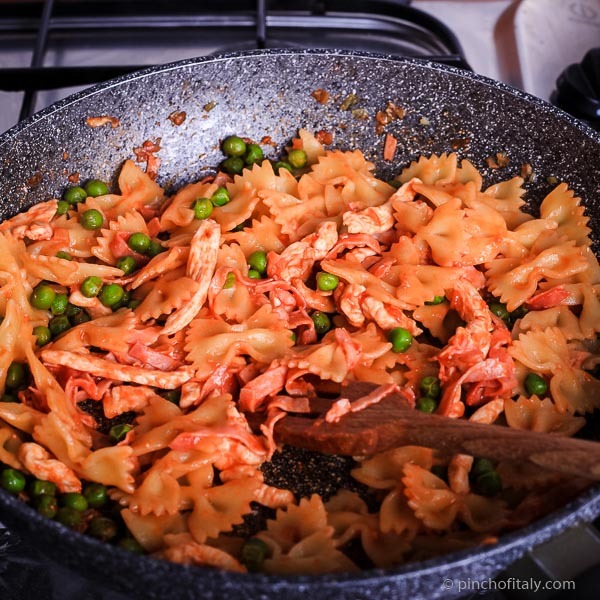 Pour the farfalle in the pan with all the ingredients and turn on low heat to warm all. Mix more and serve it. As you’ll see this is really an easy recipe. You do have to use sharp-edged knife tough. So, don’t be intimidated and be careful. 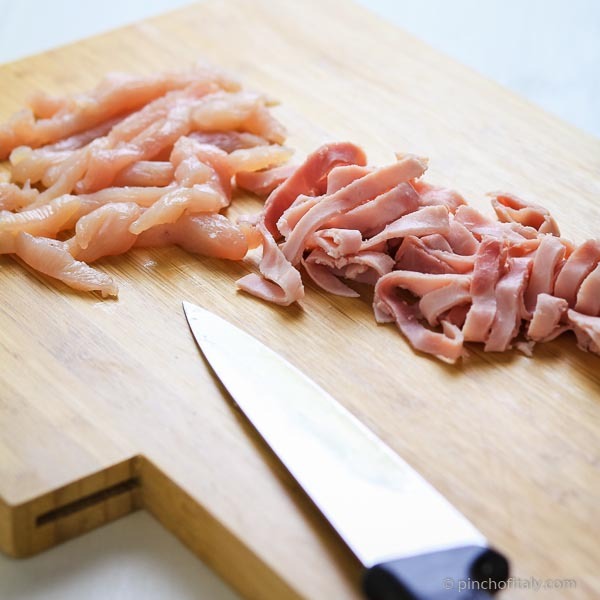 The easiest way is to take the slices of chicken breast, roll them up and then cut into thin stripes. Repeat and do the same with cooked ham. After, on the same board mince the onion too. 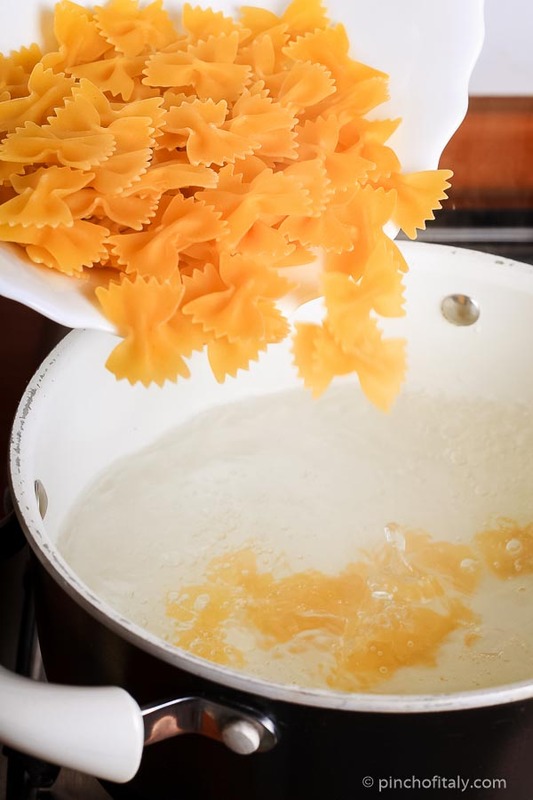 Once the water boils trow in the farfalle and cook the pasta according to the package. Usually it takes about 8/10 minutes. In a pasta pot, bring about 1 quart (2 Lt.) of water to boil. 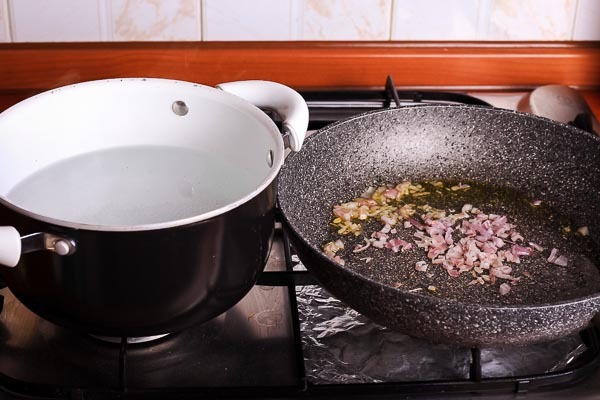 In the frying pan add the olive oil and the minced onion. At low heat begin to fry until lightly brown. Then add the stripes of chicken and cook trough. 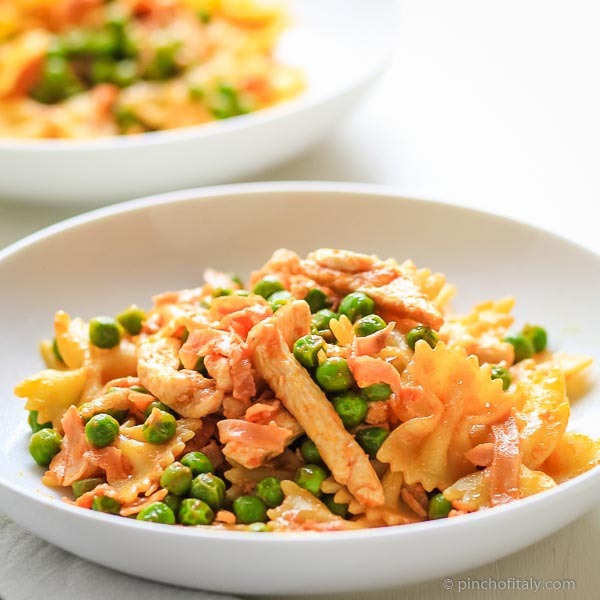 In the same frying pan, together add also the cooked ham (prosciutto cotto), peas and tomato puree and mix all. Drain the cooked pasta and move it in the frying pan. Give an extra turn, until all well mixed. Now it’s ready to be served, and if you like with some grated parmigiano cheese.